A team of British behavioral scientists had found that simple tweaks in government communication can have a big impact. They are now coming to help U.S. cities. Imagine if government could get more people to pay their taxes. And colleges had an easy way to lower the dropout rate. How about something that would guarantee more unemployed workers go to their scheduled job interviews. All of this can be accomplished with just a few words. Nothing more. The startling discovery has its roots a few years ago, when the British government was looking for a new fix to an old problem: A lot of people were not paying their taxes on time. 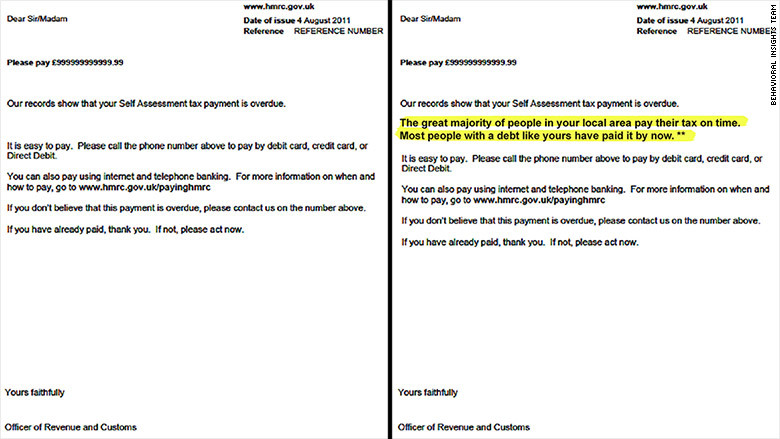 "The great majority of people in your local area pay their tax on time. Most people with a debt like yours have paid it by now." The line worked. On time payments rose by more than 15%. If applied nationwide (which has now begun), the team estimated on-time tax payments would rise by $240 million. "We're wired to behave as others do," said Elspeth Kirkman, a director at Behavioral Insights Team, the group behind the project. "On a primitive level, maybe if you didn't do what the others did you got eaten by the sabre tooth." Kirkman and her team are now coming to the United States as part of a $42 million effort by Bloomberg Philanthropies to help cities more effectively use data. Over the next three years, the foundation -- run by former New York City Mayor and billionaire Michael Bloomberg -- will partner with Behavioral Insights, Harvard, Johns Hopkins, Results for America and the Sunlight Foundation to help 100 midsize U.S. cities deliver better services and become more transparent. They'll help sort through and use the reams of data cities collect on a daily basis -- everything from foreclosure rates and public transit performance to contract award amounts and employee count. "It can help local governments better engage with citizens and deliver bigger, better results," said James Anderson, head of the foundation's government innovation program. To date, 70 cities have already signed up for the program, known as What Works Cities. Meanwhile, the group's other experiments in the United Kingdom have been promising. One found that small tweaks to an email inviting aspiring police offices to take an online entrance exam increased minority performance by over 20 percentage points -- a crucial step in getting more minorities to become cops. The tweak simply asked the test taker to reflect on what being on the police force would mean to them and their community. Another found that sending a politely worded, personalized text message to unemployed people increased the chances they would show up to a job interview by nearly threefold. Similar texts reminding community college students to show up for class led to a 36% reduction in drop out rates. "It's about retaining people's ability to make a free choice," said Kirkman. "But helping them not make a terrible one."